We’d love your help. Let us know what’s wrong with this preview of Motion Mountain - Vol. 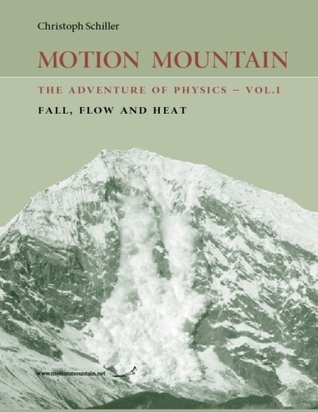 1 - The Adventure of Physics by Christoph Schiller. How high can animals jump? What are the fastest thrown balls? How fast can aeroplanes and butterflies fly? What does the sea level tell about the sun? What are temperature and heat? What is self-organization? This free colour pdf on introductory physics guarantees to be entertaining, surprising and challenging on every page. The text presents the best stories, images, movi How high can animals jump? What are the fastest thrown balls? How fast can aeroplanes and butterflies fly? What does the sea level tell about the sun? What are temperature and heat? What is self-organization? This free colour pdf on introductory physics guarantees to be entertaining, surprising and challenging on every page. The text presents the best stories, images, movies and puzzles in mechanics, gravity and thermodynamics - with little mathematics, always starting from observations of everyday life. This first volume also explains conservation laws and the reversibility of motion, explores mirror symmetry, and presents the principle of cosmic laziness: the principle of least action. This popular series has already more than 160 000 readers. If you are between the age of 16 and 106 and want to understand nature, you will enjoy it! To ask other readers questions about Motion Mountain - Vol. 1 - The Adventure of Physics, please sign up.